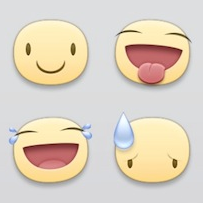 According to Facebook, stickers are illustrations of characters with personality. Sending stickers is a great way to express your feelings to your friends. Stickers are generally larger than smileys, emoji, and emoticons. Therefore, it works extremely well to attract attentions and share your emotions. Unfortunately, stickers are not available to desktop users by default. There are two ways to send stickers on Facebook from your computer: by installing a browser extension or clicking on the Facebook share link of the sticker. Facemoji has included more than 300 stickers and 200 emoji in its Chrome browser extension. To use Facemoji on your computer, first install the plugin, and you will be redirected to a Facebook login page. Login your Facebook account to start using Facemoji. 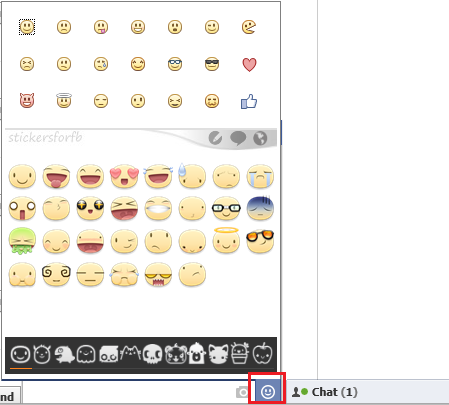 After signing in, go to any Facebook chats and you can easily locate the Facemoji icon in the textbox of your Facebook chat. Click on the icon and start sending stickers on your desktop! 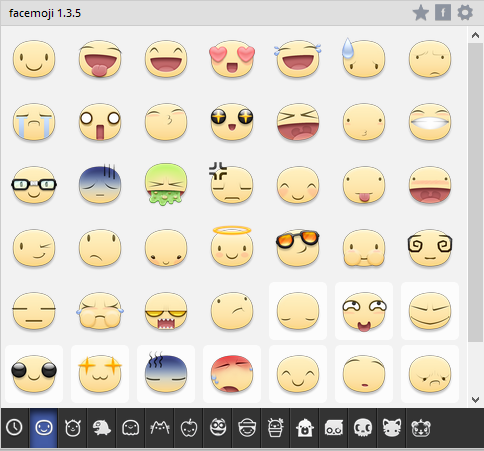 Similar to Facemoji, Chat Stickers enables Facebook users to send stickers on both Firefox and Chrome. After adding the browser extension, you will find the stickers included within the smiley icon in the textbox, as shown in the picture above (taken from its extension page). 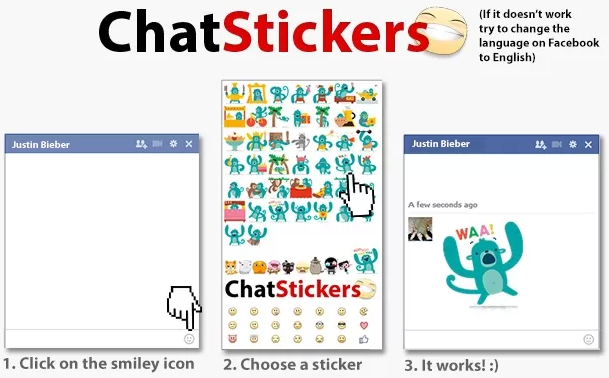 Compare to Facemoji, Chat Stickers has slightly less stickers than Facemoji. Besides, I personally prefer to have smileys and stickers icon displayed separately in the textbox instead of combining them into one. Nevertheless, it is up to your discretion as both are working perfectly fine. If you are using Internet Explorer, Stickers For Fb is the perfect option for you. Stickers For Fb has its own Internet Explorer add-on apart from its Firefox plugin and Chrome extension. 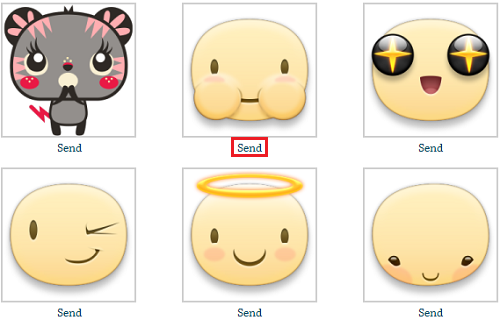 After installation, click on the smiley icon in the textbox and you will find the newly added stickers below the smileys. According to its homepage, Stickers For Fb will add another browser extension for Safari users soon. If you are unable to use these browser extensions for some reason, you may refer to this article from CryptLife.com, which provides the direct Facebook share links of the stickers. Go to the article, choose a sticker that you want to send and click “Send” which is located right below the stickers and the Facebook share page will appear. 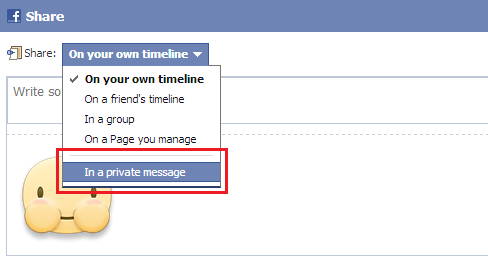 At the Facebook share page, select “In a private message” at the drop-down menu to share the sticker as a private message with your friends. Do you find any better ways to send Facebook Stickers from desktop? Share with us in your comment!